LinearScale is used to control the overall layout of tick marks, tick labels, indicators, and ranges, as well render an optional scale bar. The scale bar is rendered by the LinearScale element as a continuous band between top and bottom of the gauge. 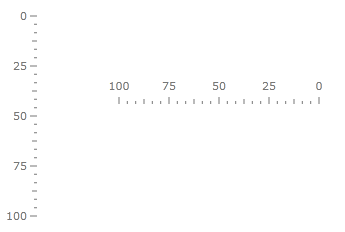 The scale bar is also used as a basis for the placement of child elements, such as the tick marks. The height of the scale bar is controlled by the RelativeHeight property for the RadVerticalLinearGauge and the width of the scale bar is controlled by the RelativeWidth property for the RadHorizontalLinearGauge respectively. This value should be between 0 and 1 and is relative to the height of the container which contains this scale. The location of the scale is controlled with the RelativeX and RelativeY properties. The thickness of the scale bar is controlled by the StartWidth and EndWidth properties. The only parameter is passed to the tooltip format string is value at the element location.